A sunny spot, for example at the end of a vegetable row or bed. Young seedlings easily tolerate spring frosts, and may survive winters in mild climates. 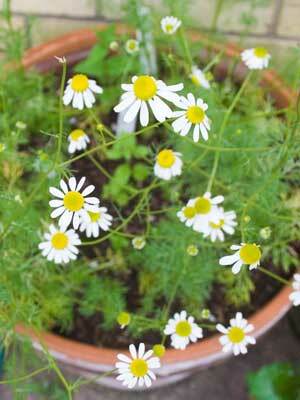 The easiest chamomile to grow is a cool-season annual. Cabbage, Lettuce, Spinach, Calendula, Cilantro, Feverfew and Mint. Leafy greens grown in spring, as well as spring-blooming herbs and flowers. Seeds can be started indoors or sown directly in the garden. When allowed to shed mature seeds, chamomile often becomes a welcome volunteer plant. Feathery chamomile foliage contrasts well with the textures of other herbs and flowers. Cut branches when they are holding numerous open flowers, and hang in small bunches to dry. Chamomile tea is made from the blossoms only. When the stems are dry, pop off the blossoms and store them in an airtight container. Rabbits enjoy nibbling chamomile foliage.